NORMAL – One Governor candidate is hoping to improve college grants and keep students in Illinois. 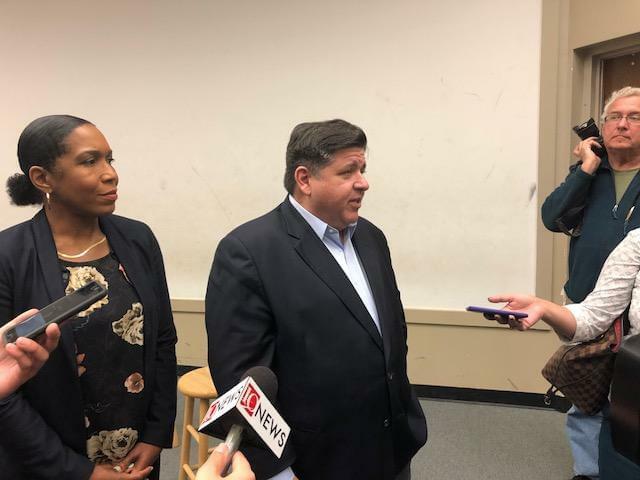 Democratic Gubernatorial candidate J.B. Pritzker visited Illinois State University Wednesday as he discussed his plan to combat problems within higher education. “One of the things we have promised to do is go back and reverse the damage Bruce Rauner has done to budgets across the state to help our colleges and universities…second we want to expand our MAP Grant program to another 70,000 kids to help keep them at in-state institutions,” said Pritzker. In a question and answer format, Pritzker highlighted his plan for higher spending on financial aid and his support for a graduated tax to make wealthier Illinoisans pay more. He also blamed Gov. Rauner for universities not having a stable source of revenue. “Lets start with stabilizing funding at universities by making sure we have a budget…that’s something Rauner failed to do for two years and in a third year he vetoed it,” said Pritzker. Joined by running mate State Rep. Juliana Stratton the duo addressed more than 50 students and faculty during the visit. Other plans included a single state-wide application form for every public university and better promotion of state universities in high schools.